Ultrasonic tracking no special paper needed. Ben. 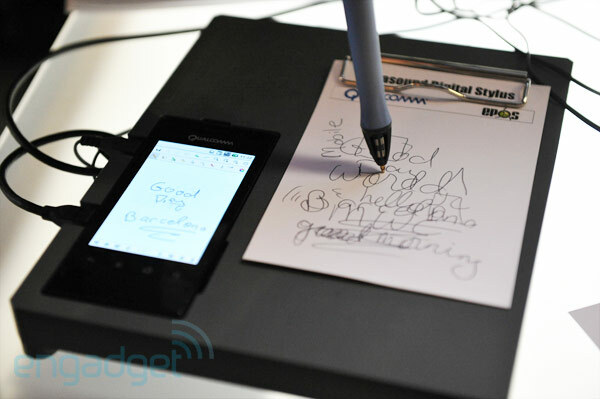 LG's Netflix-lovin' Revolution wasn't the only standout demonstration at Qualcomm's MWC booth -- the company also cut out a bit of space to showcase a wild new ultrasonic pen that's able to transcribe writing on paper directly into one's phone, tablet or laptop. The gist of it is simple: the pen can be equipped with an actual ink pen or a simple nub, and there's a battery-powered transceiver inside. Using standard, off-the-shelf microphones on a mobile device, your future phone or tablet could pick up vibrations from the pen with a radius of around 30 centimeters. Underlying Epos software is used to convert vibration and coordinate information into text, and from there, any 'ole text app can be used to field the results. We were even shown a brief demo of a prototype language translation app that enabled the demonstrator to write a sentence on paper beside the phone, and have the phone itself take in the English phrase, convert it to text, and then translate into a foreign tongue. It's a fairly impressive feat, and there's some pretty obvious usage case scenarios here -- this could easily reinvent the art of note taking in class, where those who prefer to jot down reminders on paper will be able to log those same bullet points on their laptop as they scribble. Vid's after the break, per usual.